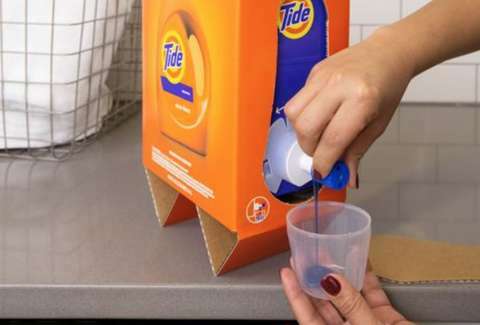 For vendors of something as deeply unsexy as hypo-allergenic laundry detergent, Tide seems to have no trouble drawing attention to itself: The brand's latest packaging is a perfect replica of a box of Franzia, but filled with liquid soap. It's like Sunset Blush wearing a Halloween costume. And also, it might kill you, so don't drink it. After hundreds of calls to poison control over consumption of the candy-likened Tide Pods roughly a year ago, it's honestly astounding that the company didn't see this one coming. It feels like a generous holiday gift to the meme artist community at large. Someone please warn every college student in America: Slap the bag isn't nearly as fun when you're swallowing ammonium. The new look was part of an attempt to create more sustainable packaging: it uses 60% less plastic than your standard container, and it's cheaper to ship in box-form, according to a report by CNN. Tide producers, Procter & Gamble, did not take into consideration, however, the fact that their product now resembles a fire new Franzia X Tide Soap collab. As is expected with any hot detergent-related scandal, there was much to be said on Twitter. We assure you, we're just as excited about this rebrand as you are. But please, do not drink this laundry detergent. It is literally a chemical formula intended to remove stains from your sheets, and we promise, the stuff will not feel "Free & Gentle" when it comes in contact with your organs.